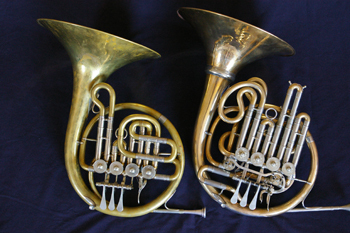 As descant horns began to be used more widely by professional high horn players after WWII, two types of designs or design philosophies for double descant horns emerged. One type of descant was essentially a standard single B-flat horn with a high F side added. The bell was of a type and size that would be typically used to make a double horn and the instrument thus has a “feel” very similar to that of a regular instrument but with a high F side. The other type of descant was constructed either as a dedicated instrument in high F or as a double descant geared around the high F side. While only rarely produced by makers today, these instruments are around and quite interesting to explore. Before looking at double descants specifically, on the cover of my new publication Playing High Horn I illustrate an instrument owned by ASU, the single F descant by Alexander on the left in the photo. Most hornists, on first sight of this instrument, say it is just about the cutest horn they have ever seen. 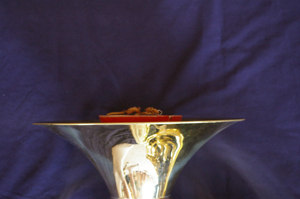 With a light and clear tone in the high range this instrument is a great little horn but it is also somewhat limited as to how useful it is in reality, as it only works well on very high, light horn parts. This instrument has a fourth valve; it is tuned to equal a 1-3 combination and may be used to obtain notes as needed in the gap between F-sharp below the staff and low C. The fingerings are identical with those of the mellophone or trumpet. The most unique feature is that the bell of this instrument has a very small throat. This is most easily illustrated photographically: note the distance a mute sticks out of the bell of the small descant compared to a more average modern Paxman L bell in the following photos. Also, for additional comparison, the bell throat is almost exactly half way between that of a Conn 16E Mellophonium and a King 1170 mellophone. This tighter bell throat makes good sense as they are all instruments dedicated to the high F pitch length. At the same time, however, and taking nothing away from the abilities of Alexander, the tiny bell gives the instrument an overall tone that in the mid-range sounds very much like a mellophone or Flugelhorn. In the very high range it sounds like a horn, but in the lower range it is obvious that it is something else. Recently I learned that another Phoenix area player also had one of these “small” descants, but this one is the full double version of the instrument by Alexander, on the right in the photo at the top of this page. First, let me say that I have tried a number of Alexander descants and they have tweaked the design repeatedly over the years. Their current production uses a bell that is either similar or identical to that used on their model 103 double. This instrument however dates to 1961 and uses this same “small” bell as the ASU single descant. Both of these instruments play GREAT on the high F side. It really does not get much better than this, the intonation is really quite good and production is comfortable. The double certainly has a bigger/darker tone than the single; the extra weight and longer tubing does come into play to its advantage. The high ranges are amazing. Having played on many double descant and triple horns I would say that most have issues on the high F side which these horns do not have. Where the double really shines between the two instruments is in the mid range—the tone is quite horn-like. It would probably stick out a little in a section situation, but the sound is quite manageable and familiar, easily recognized as a horn sound in the mid and upper register. On the negative side, both feel pretty different than a modern double horn. They are very compact instruments and feel small in the hands. But more importantly in the lower range both have an odd resistant quality, especially the double in the lower range. This is in part a function of design. We are used to playing horns that are basically designed around the B-flat horn, and an instrument truly designed around the high F side just feels different. Overall the bottom half of the range of either instrument is not great. As a result it is not as easy to switch back and forth between standard double horn and a descant of this design as compared to a more modern descant horn. If you intend to make use of a descant in some musical situations and a standard double in other situations it is important to feel that you can go between both instruments easily. This is why modern descant designs have developed and largely replaced these instruments with small bells and wraps--a modern descant feels more like a standard double horn. 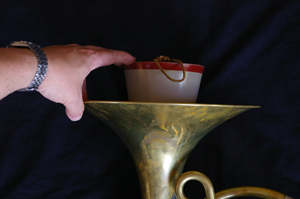 A triple horn solves this problem even better, as made correctly the whole horn will play well with a similar feel top to bottom. But that said there is certainly a place for a small descant of this type for very high register Baroque works such as those seen in some works of Bach and Telemann. As already noted the high F side is great on these instruments, and combined with the light weight of the instrument the result is I can play probably a third higher on either of these horns than I can on my triple horn. A lot of weight is gone and the design is just more efficient for the high F side. Of the two horns in this article the double feels great on solos like the Telemann concerto and the single works great on very high excerpts such as seen in Bach cantatas. In short, while these models would not be my first choice for a descant horn for general use, you should keep your eyes peeled if one comes your way and check it out. It is quite interesting to see how the instrument feels when geared around the high F side; it would be handy for certain works and is a valid design approach. For more information on descant horns visit Descant and Triple Horns and also purchase Playing High Horn from Horn Notes Edition.